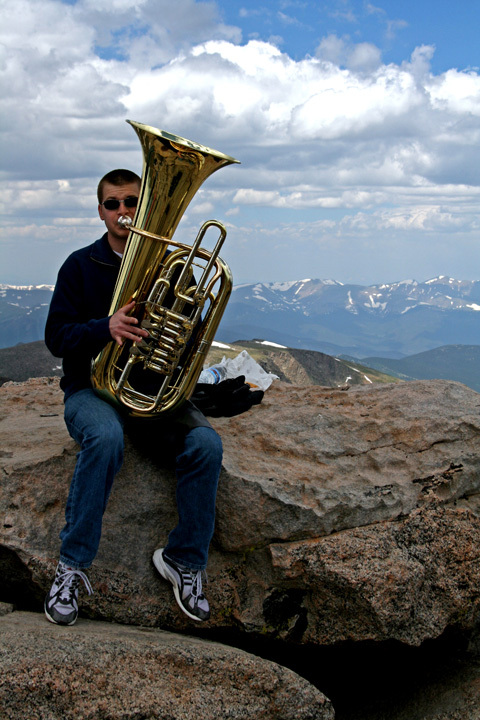 Classical music at 14,268' elevation. Heard this great music while photographing mountain goats on Mt. Evans. I looked up and saw this young man at the summit playing his bass horn. I hiked up to the summit and got this photo. this would have been much better without those things (water botle, black clothe, etc) on the rock. It looks snapish as it is. The fact that there's a tuba at this elevation boggles the brain. Bonus point for the oddity of it all! No seriously, the only way this could possibly be better is if the guy was wearing a tuxedo. Interesting. Beautiful setting. But it would have been better if you had hidden the water bottle and papers and junk beside him. Proudly hosted by Sargasso Networks. Current Server Time: 04/19/2019 08:19:12 AM EDT.